Learning with video is great. You get to hear Japanese. You get to see Japanese. The language gets embedded into your brain because you’re using more than one sense. But, with all of the content out there… what are the “must-have” Japanese video lessons? You want the no-fluff, no-distraction videos that help you ACTUALLY understand Japanese, right? Here they are. Top 10 Japanese Video Lessons for Beginners. Ready? This first Japanese video lesson is exactly what beginners need. You will learn some simple words for introducing yourself. So, all you have to do is stick in your name into this phrase: Watashi wa ____ desu. Now you can introduce yourself. Next, you should learn some basics. Like asking questions. To ask questions in Japanese, all you need to do as say “ka” at the end of the sentence. What’s “Ka?” “Ka” is just a sound that turns a sentence into a question. It’s like a verbal question mark. Kore wa mizu desu ka? Now that you know how to ask general questions in Japanese, let’s learn some more. 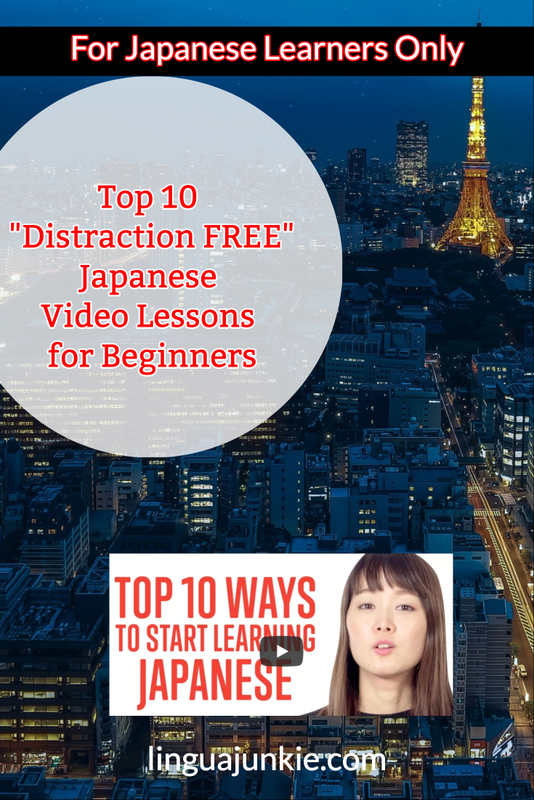 Do you see how easily you can learn with Japanese video lessons? As long as you’re learning with the right lessons AND in the right environment, you’re good to go. No distractions. No extra videos. No unrelated videos to grab your attention. How do you tell or ask for time in Japanese? Here’s how. Do you notice the “ka” at the end of the sentence? That’s right. That’s what you learned above and that is what makes this a question. Play this next Japanese video lesson to learn how ask about where things are. You can ask by saying the word “onegaishimasu.” What does that mean? Watch the video. 7. Saying something “is NOT” in Japanese. Negative statements. You’ll need to know 3 phrases of varying formality. If you watched all of these Japanese video lessons, you’re ready for the next one. Why? Because you will hear all of the things you’ve learned earlier. Remember, coming across “things you have learned before” in other lessons is GOOD. It means that that information is only getting refreshed in your brain. You will remember it better. This is a bit of a long lesson. You will hear a much longer Japanese conversation but you should now know all of the stuff inside. If you made it this far, you’re clearly smart and motivated. Let’s jump some more sophisticated Japanese video lessons. You probably want to know how the Japanese language works, right? Let’s learn grammar then. Now, if you’re truly ready to learn Japanese, here are some tips and tricks. This video lesson shows off all of the ways you can learn with Video and Audio Lessons that are available at JapanesePod101 (click here). If you’re ready to stop reading articles and start learning with an actual program, this is for you. If you’re not ready, you’ll find this just as useful either way. Knowing “how to learn” is just as important as learning. These are the top 10 Japanese video lessons for beginners. Are there more? Of course there are. Do you want more? If you’re a greedy Japanese learner, you do. But, you should learn in the “right environment” where you have no distractions like social media. Where it’s just you and the lessons. I suggest JapanesePod101, as I’ve mentioned before, for their audio and video lessons. P.S. I recommend this for Japanese learners. If you REALLY want to learn to Japanese with effective lessons by real teachers – Sign up for free at JapanesePod101 (click here) and start learning!